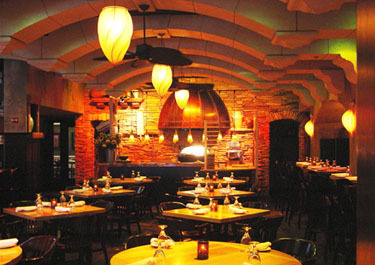 Rustic Kitchen Bistro & Bar is a state-of-the-art bistro located in the heart of Boston's Park Square. The 250 seat design evokes the feeling of a warm, inviting Tuscan villa and has several specialty private rooms including The Tuscan Dining Room, The Wine Cellar Room and a glass enclosed Garden Lounge. The Italian-Mediterranean inspired menu, designed by Executive Chef Tom Holloway, reflects many seasonal Rustic favorites. One of the main features of Rustic Kitchen is a one-of-a-kind intimate broadcast TV studio kitchen, called The Rustic Kitchen Viking Studio, where the cooking show In The Kitchen is taped live each Friday evening; diners can watch all the action from the main dining room. Rustic Kitchen will be coming to Mohegan Sun at Pocano Downs in the Summer of 2008!